Rose Squared Productions announces a call for artists for the Spring Fine Art and Crafts at Brookdale Park. 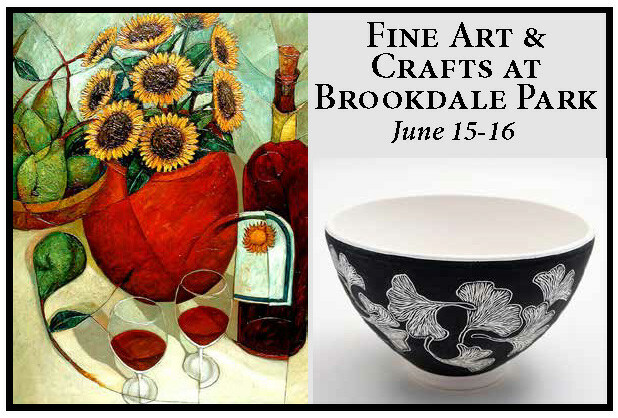 Located a half a mile from the Garden State Parkway on the border of Bloomfield and affluent, arty Montclair, Brookdale Park is a lovely setting for a quality, outdoor fine art and craft show. Presently in its 31st year, the show is co-sponsored by the Essex County Department of Parks, Recreation, and Cultural Affairs and Rose Squared Productions. Held rain or shine on June 15-16 from 10am-5pm. The show is presently in its 31st year, features 160 fine artists and fine crafters, and has been selected as one of Sunshine Artists Magazines top 200 shows in the country. Most Spring Fine Art And Crafts At Brookdale Park exhibitors can park behind their space with their canopy backdrop in place. Setup is all day Friday and early Saturday morning. The free-to-the-public show runs from 10am-5pm. A minimum of four images of works and one of display is required for jurying. Jurying for jewelry closes on January 8. Other categories are juried on an ongoing basis with categories closing as they fill. Excellent PR/advertising with strong Facebook/Instagram paid ads. Spring Fine Art And Crafts At Brookdale Park promotion includes first class mailing to past patrons (25,000) and multiple email blasts. As former exhibitors, Rose Squared Productions knows what artists need to have a successful event. They have been promoting fine art/fine craft events for 37 years in beautiful county parks, creating excellent marketing opportunities for the participants. Both Howard and Janet Rose were full time teachers at a central New Jersey High School. Janet taught English for 26 years and Howard was a Vocational Graphic Arts teacher for 27 years. They retired in June 2000. Before beginning show promotion, both were professional potters creating wheel-thrown, functional stoneware participating at quality craft shows for approximately 6 years throughout the Northeast (Lincoln Center, Peters Valley). Knowing what it is like being exhibitors allows them to create a show with the exhibitors interests, both fiscal and physical, in mind. They are committed to keeping out “buy/sell” and reducing as much of the risk an exhibit takes in participating in their shows. After assisting running an art and craft show at their Temple, Howard and Janet decided to form Rose Squared Productions and create a quality, juried event in Essex County. The name Rose Squared is from Howard’s grandmother, Rose Rose. Being two Roses, they formed the business with the appropriate name. Their first show was held at South Mountain Arena in West Orange, NJ. After the second year, the business was expanded to include free-to-the-public shows in Montclair, Verona, Upper Montclair, and Cranford. Shows are held in co-sponsorship with the Essex County Department of Parks, Recreation, and Cultural Affairs and the Union County Department of Parks and Community Renewal. For more information, contact howard@rosesquared.com.